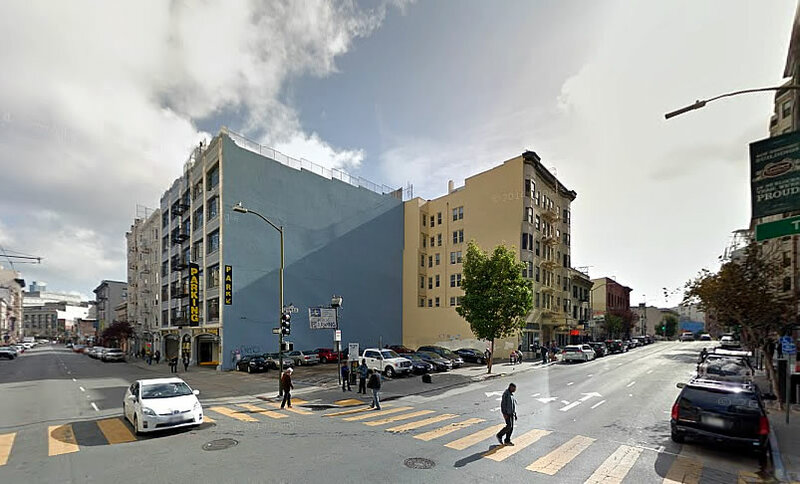 Back in 2005, the then-owner of the parking lot parcel on the southeast corner of Jones and Turk filed for permits to build a 5-story building at 180 Jones, a building height which the Planning Department deemed too short for the Tenderloin site which is zoned for development up to 120-feet in height. In 2008, the owner re-filed for permission to build an 8-story building with 37 residential units over 2,700 square feet of retail and 8 below-grade parking spaces, a plan which the Planning Commission approved in 2009 with a three-year window in which to start development or lose the right to build. Three years later, the ground had yet to be broken. And given the economic downturn at the time, a downturn that waylaid more projects than all the NIMBYs combined, the Planning Commission approved a three-year extension for the project’s entitlement in September 2012. In February 2013, the site was sold for $2.2 million. And with the aforementioned three-year extension about to expire, building permits for the 180 Jones Street project were issued three months ago. At the same time, the California Parking Company has requested a one-year extension of their permit to continue operating the parking lot on the site, a request which was approved this past October. And the 180 Jones Street parcel is now back on the market as an approved development site, as it has been for six years and counting. I really hope they get to build it to 120′! should be upzoned to 200 ft with all market rate housing. Thats a good way to turn around the tenderloin. seems like the hood still scares off many. wondering about the fate of the project at hyde and golden gate, i think it had one more minor hurdle. According to a Sept. 1, 2015 item at Hoodline.com, a “final appeal” was to be heard the next day addressing neighbors’ objections to its approval. Although I did not see an item thereafter expressly addressing the outcome, a 12/02/2015 follow up indicates demolition of the post office could begin as early as this January as the lease of USPS expires December 31. 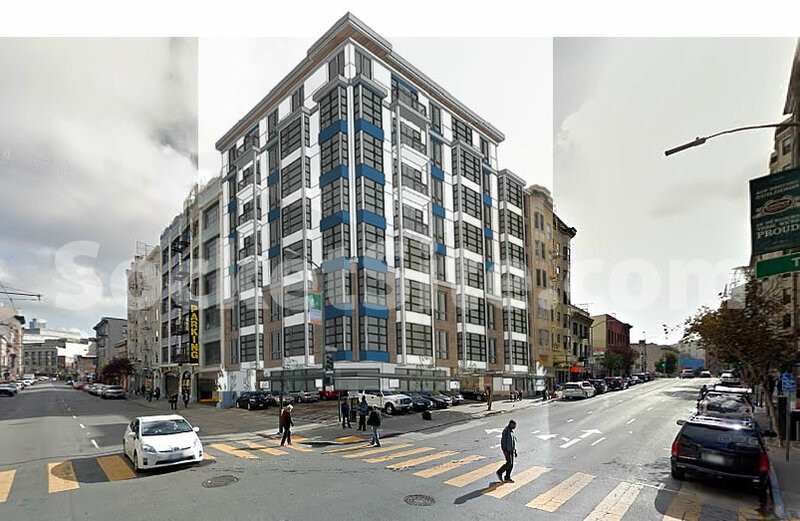 That same article at Hoodline includes an impressive round up of the status of other Tenderloin/Mid-Market development proposals. I hope that building is built strong enough to hold up against the other buildings that abut the site-lines and may cause the whole block to go up in a pile of rubble….Parking Garage on one side, and a lot of un-reinforced buildings adjacent is not a prime density site liability wise… Ground floor looks a little squished maybe a better pedestal/ground floor retail height? URM….er, uhm, no. What’s the basis for your claim? The two neighbors look like reinforced concrete to me. The render shows a parking lot on the first floor? Pretty sure that’s a mistake in the way the render was placed over the photo. Wow, I’ve heard the sentiment that NIMBYs believe bigger building eat the smaller ones… but this guy actually believes it! It’s a normal building with no parking. The image is just a lazy photoshop. Is this Ben Carson’s architectural alter-ego? The Tenderoin has a critical need for a grain storage facility. That’s the problem with these contemporary designs. They are dated within a year or less. I guess 2005 was a good year. I like it. It seems private profit is not always the most efficient manner to develop needed housing. How so? If private profit had been allowed to be the primary manner of deciding, this would have been developed 10 years ago, and been an additional ~25 units of housing for those ten years. Instead, bureaucracy has given us a parking lot for that time. Where in the World did you come up with that analysis given the facts related above? It’s clear that the inactivity has resulted from the owners’ “mothballing” the property awaiting the opportunity to exploit its potential for private financial gain to the maximum resulting in no activity either due to market considerations or their personal situation. Planning was right. That would have been a gross underutilization IF it had ever gotten built. Perhaps they were. Still seems that having some housing for 10 years is more efficient than having none.